MARCH 22, 2018 – When Rachel Jacobson started teaching at Hebrew schools on the North Shore in 1977, the conservative synagogues held classes three days a week with mandatory attendance expected on Shabbat. She remembers the curriculum’s concentration on learning to speak and write Hebrew, and on learning prayers at Shabbat. “The kids were comfortable with the language,” the Jerusalem native said. “I won’t say the kids were extremely happy to be there, but on the other hand they learned and parents made sure their kids were there. Hebrew school was part of the family’s daily lives. I felt the parents were behind us,” she said. After 40 years of teaching all age groups, from preschoolers to adults, at religious schools at reform, conservative and orthodox congregations, she is concerned that today’s religious schools are not preparing Jewish children for the future. Religious schools have always competed with secular activities (especially sports) for students’ limited after school time. Contemporary Hebrew schools face significant additional hurdles in attracting and keeping their students: intermarriage, diminished Jewish institutional affiliation, and the fact that in many families, both parents work full-time, making scheduling and involvement even trickier. Despite these obstacles, total enrollment at religious schools in Andover, Peabody, Gloucester, Newburyport, Beverly, Marble­head and Swampscott is more than 750. The North Shore pedagogic styles span the gamut from structured and traditional to student-driven, interactive and contemporary. Their enrollment numbers range from 22 to 247 and schools meet from fewer than three hours to more than two times per week. Few go beyond B’nai Mitzvot ages. Delving below the surface, however, reveals the schools have more in common than it might seem. They all share common goals of teaching their students Hebrew, Torah, prayer, Jewish values and Jewish history, and they all thrive by adapting to conditions that didn’t exist 40 years ago. At Temple Emanu-El in Marblehead, 190 religious school students attend grades pre-K through 12. 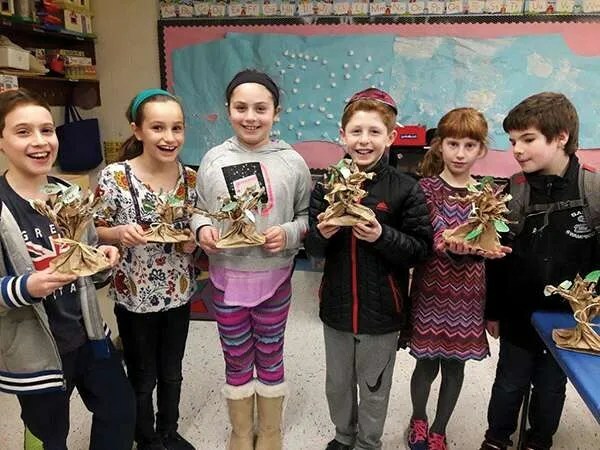 Liz Levin, Temple Educator, describes the reform synagogue’s curriculum as “emergent.” She explains that each grade has a topic of focus and the teacher creates lessons and projects based on what the students themselves find interesting within that topic. “Our goal is to teach students how to ask questions about Judaism and how it affects their daily lives, and then help them learn how to find answers to those questions,” she said. The preparation to go out in the world and make a positive difference resonated with Julie Zabar, who graduated as a 12th grade post-confirmation student two years ago. “The most important thing I learned in Hebrew school was how to be a person anyone would be proud of simply by following many of the Jewish values I was taught,” she said. A mile down the road, Congregation Shirat Hayam’s Conservative Center for Jewish Education enrolls 95 students from pre-K through 7th grade. Religious School Director Janis Knight describes the curriculum as project-based learning with differentiated lessons that use more technology on non-Shabbat days. Shirat Hayam recently changed its Sunday class day to Saturday, a challenge for younger grade teachers whose lessons could not include cutting, writing or drawing. However, parents are delighted with the change, despite kids sometimes dragging their feet on Saturday mornings. 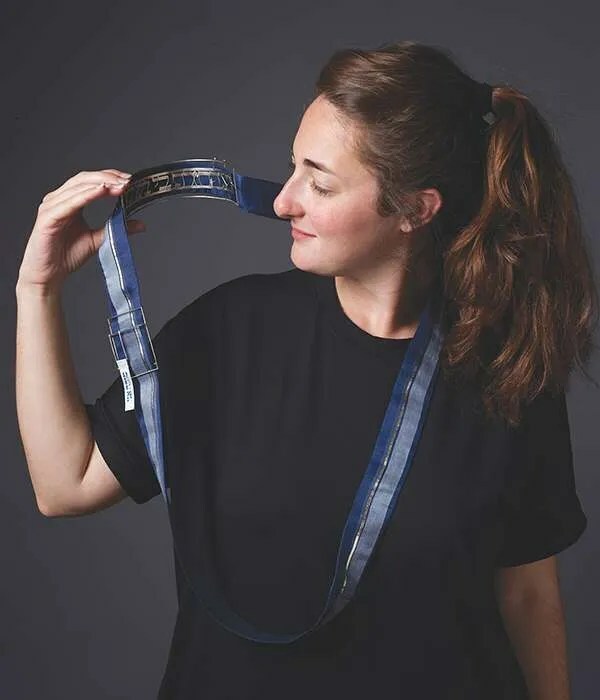 “My 6th grade daughter, Jasmina, feels very at home at Shirat Hayam and connected to the community. 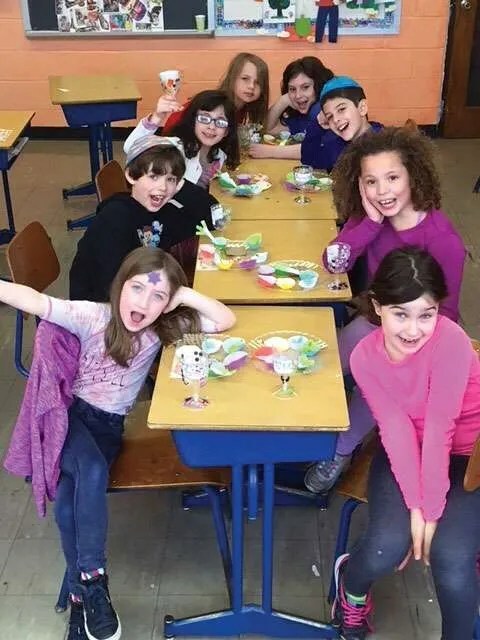 Our Saturday morning program, which brings the whole family to shul for various programs, services, music and lunch, has played a big role in that,” said Alex Shube. Facilitating family involvement in synagogue life has become an important function of today’s religious schools. A generation ago, families supported synagogue school for their children’s Jewish life; today, the synagogue school often supports the Jewish life of the family. 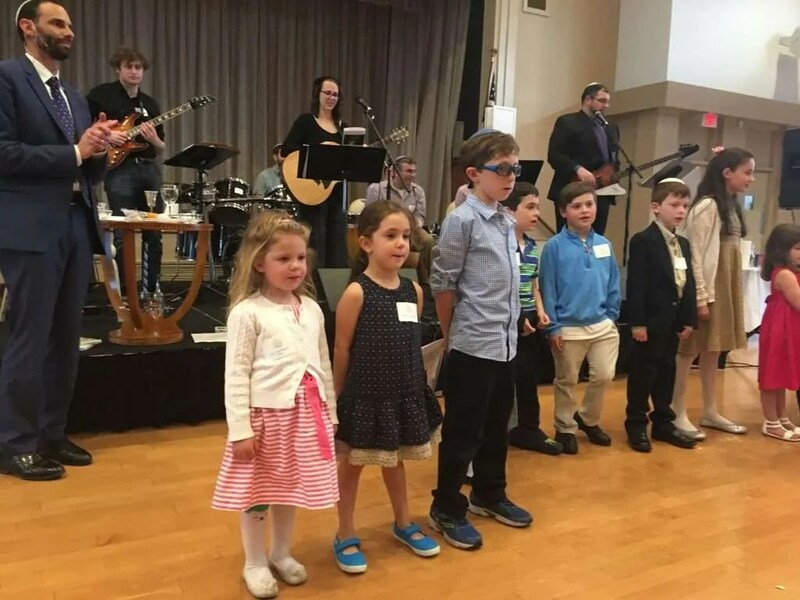 “In 75 percent of the families connected to the synagogue, one of the parents isn’t Jewish,” said Phoebe Potts, director of Family Learning at Gloucester’s Conservative Temple Achavas Achim. She sees her job as not only overseeing the 22 K-7 students in the religious school, but also helping parents to raise Jewish children. “With less of a Jewish influence at home, a synagogue and synagogue school becomes the majority of some students’ contact with Judaism,” she said. Conflicting priorities of families and making religious school accessible to busy families are also topics Dr. Skolnick Einhorn overhears a lot of her students discussing. “There are at least one or two theses each year that try to attack that,” she said. Some proposed solutions have included adding one day that can be done on line, using a flex model of scheduling, and reducing the total number of hours. At Temple B’nai Abraham in Beverly, a “full service synagogue that follows the principles of the Conservative movement,” Educational Director Deb Schutzman has tried to accommodate scheduling challenges of working families. The school meets Sunday and students choose either Tuesday or Thursday. “We found offering just one day was too limiting. It’s so important to engage and educate the entire family,” she said. Although many religious schools have teen “madrichim” (teachers/aides), post 7th grade classes are rare. 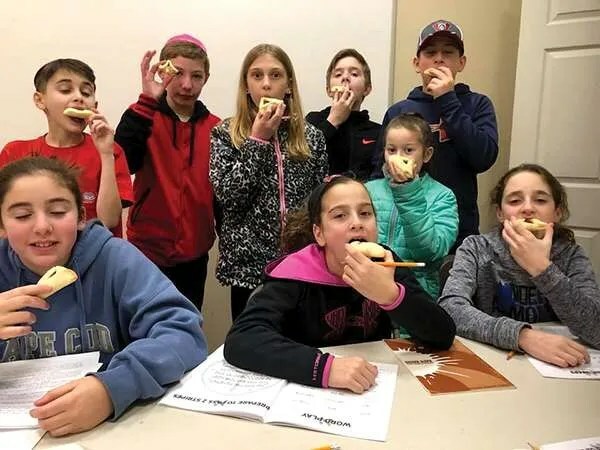 Nonetheless, Temple Tiferet Shalom in Peabody, Temple Emanu-El in Marblehead and Temple Emanuel in Andover all have post-B’nai Mitzvot classes that include confirmation (grade 10) and, in Marblehead and Andover, post confirmation through grade 12. Judy Matulsky, administrative director in Andover said changing classes to once a month and lowering the tuition brought back many of the grade 8-12 kids, with current enrollment at 50. “Once you get a few, the others seem to jump on board,” she said. Many administrators and directors bristle at the suggestion that a religious school that changes its curriculum and schedule to adapt to families’ 21st century needs has “watered down” the Judaism taught in the more traditional Hebrew schools of previous generations. “Parents are not looking for the same thing our parents were looking for. If we are to keep the kids and families engaged for the next generation, we need to be innovative, exciting and hands on,” said Schusterman, of Chabad of Peabody. Community Seders bring us together on Passover – Dayenu! MARCH 8, 2018 – As sunset approaches on Friday, March 30, and Saturday, March 31, Jews all over the world will observe the centuries-old tradition of sitting down to a Passover Seder, the ritual feast that commemorates the exodus from Egypt. Some will host families and friends, setting the table with treasured dishes filled with recipes handed down from generations past. Many living on the North Shore will choose to join one of over a half dozen community Seders led by spiritual leaders at synagogues in Beverly, Gloucester, Marblehead, Peabody, and Swampscott. Rabbi Meyer credits the popularity of Temple Emanu-El’s Seder in part to the hard-working volunteers who cook all the food in the temple’s kitchen. “There is a very heimish [Yiddish for homey] feel that all the food has been cooked by your fellow congregants,” he said. Heidi Greenbaum, one of the kitchen organizers, has volunteered at Temple Emanu-El since becoming a member 19 years ago, helping with the Seder for the last decade. On the same night a mile down the road in Swampscott, Congregation Shirat Hayam will hold a Seder fully catered by Becky Convincer. Rabbi Michael Ragozin expects a mix of congregants without local family, and those who choose to attend a community Seder “because they enjoy it. We try to tell as much of the story through song, led by Cantor Elana Rozenfeld and the Ruach Band,” he said. Rabbi Alison Adler will use the teachings of Rebbe Nachman of Breslov as the central theme when she leads between 80 and 100 congregants at Temple B’nai Abraham’s second night community Seder in Beverly, which will be catered by Levine’s Kosher Meat Market. ‘“The Exodus from Egypt occurs in every human being, in every era, and even in every day,’” she said, quoting Nachman, a great-grandson of the Hasidic movement’s founder, the Baal Shem Tov. Based on past years, Rabbi Schusterman expects from 45 to 75 people will attend the Chabad’s first night Seder, which his wife, Raizel, and volunteers will prepare. “Because Passover dietary laws are very specific and strict, this is one of the things you just can’t outsource,” he said. At Temple Sinai in Marblehead, Rabbi David Cohen-Henriquez, his wife Cynthia, and a volunteer congregant couple will cook and prepare their first night community Seder, which is capped at 50 attendees “to try to keep that homey, intimate feeling,” the rabbi said. Born and raised in Panama, where his family has been a part of the Jewish community for 130 years, Rabbi Cohen-Henriquez has vivid memories of attending community Seders during his youth. Two international influences he will bring to Temple Sinai’s Seder are his family’s time-honored Sephardic Caribbean charoset recipe and a unique ritual he picked up a few years ago in Los Angeles from a Persian community he worked with: Participants whip each other lightly with leeks during “Dayenu” to imitate the Egyptian taskmasters who whipped the Jewish slaves. Rabbi Steven Lewis and Temple Ahavat Achim are hosting a second night Seder in Gloucester. As a sign of our times and the welcoming spirit of the temple, both a chicken and a vegetarian meal are offered at the Seder, which is always a sellout. The recent uptrend of community synagogue Seders does not surprise Jonathan Sarna, Brandeis University Professor of American Jewish History and Chief Historian for the 350th commemoration of the American Jewish community. He traces the rise, fall, and revival of synagogue Seders to the late 19th and early 20th centuries, when Reform Judaism de-emphasized outward ritualized worship (such as celebrating a Seder) in favor of a focus on beliefs and ethics. By the time the tide turned in the mid 20th century, many Jews had never experienced a family Seder. “Synagogues really took on the role of teaching how to make a Seder,” Sarna said. Years later, with the advent of more Jewish education, the convenience of kosher-for-Passover foods, and the availability of new haggadahs and “how-to” Judaism books, creating a Seder at home became less intimidating and the trend shifted away from the communal and back to intimate family Seders. Although Sarna has not studied whether the trend is reversing yet again back to community Seders, he would not be surprised if that was the case, citing the rise of intermarriage and the increase in women working outside the home. “Making a big Seder at home is very difficult, especially if you didn’t grow up with one,” he said. While Rabbi Meyer acknowledged that many people attend a community Seder because they have nowhere else to go or don’t have the time to make a Seder at home, he stresses that many choose to come simply because they enjoy the camaraderie and the opportunity to learn more about the holiday. $18/Children ages 4-13; free/children 3 and under. $25/ages 3 to 7; free/ages 2 and under. Members: $36/adult; $18/child under 12. Non-members: $45/adult; $18/child under 12. Members: $42/adult, $15/child (12 and under). $40/adult reserve by March 20; $50 after March 20. Mandy Roberge, owner of Wicked Good Henna, gives Brenda Cohen her first henna tattoo. Last Friday night, over seventy women left their families, pets and chores at home and trekked over to the Swampscott Library for Ladies Night Out, the fabulous Friday fundraiser sponsored by the Friends of the Swampscott Library with help from library staff. The evening was a heaven-sent respite from the wintry ravages of March. Jazz wafted through the library, transformed to resemble more of a cocktail party than house of culture and learning. Attendees were treated to a stress-free evening of pampering, chatting, eating and drinking. Women received one complimentary service with more available to purchase, and they enthusiastically signed up for henna tattoos, Reiki, massage, Tarot and Angel card readings, and personal image consultations. Exciting raffles, pop-up boutiques, speakers and sumptuous appetizers donated by Whole Foods were the icing on the cake. Becky Brandt, owner of Nurture Massage and Wellness in Swampscott, brought her massage chair and complimentary goodie bags to the event. The Swampscott native, who has practiced massage therapy for 7 years, was delighted to be part of the evening. “This looks like a really fun night. There’s a little bit of everything for women to come in and enjoy,” she said. The area that created the biggest buzz, however, was Mandy Roberge’s henna tattooing table. Women gathered to watch Roberge ply her craft and to pick out which design they wanted when, at long last, it would be their turn. Roberge, who lives in Leominster and owns Wicked Good Henna, was invited to participate by one of librarians, a friend of hers. “This event is a nice way for libraries to treat their patrons and also to bring in new people,” she said as she put the finishing touch on a tattoo by sprinkling it with pink sparkles. Alison Kenney, a Marblehead resident and Swampscott Friend for 20 years, heard about this type of event from another library and thought it would be a great fit for Swampscott. “We were looking for new ways to engage the community and raise money and this came out of a brainstorming session with some of the librarians, ” she said. “The library is 100 years old, but it is very vibrant tonight,” she added, as she excused herself to go to her Reiki appointment. Phyllis Sagan, owner of Sagan Realtors in Swampscott, captivated the audience with her humor, advice and personal tales of running a business. Two speakers, Life Coach and Certified Yoga Instructor Molly Williams and Phyllis Sagan, owner of Sagan Realtors, addressed the standing room crowd. Sagan talked about her experiences starting and growing her business, now in its 34th year, peppering her talk with humor and sage advice. “I live by the motto, ‘No challenge, no business,’” she said. Alyce Deveau, Swampscott Library director, and Izzi Abrams, co-head of Children’s Services, prepare to draw the winning raffle tickets. The Friends is a tax-exempt entity that provides volunteer help, conducts an annual book sale, sponsors programs for adults, purchases all museum passes, funds the library newsletter and underwrites many Young Adult and Children’s Room activities. The evening’s $50 cost included a year’s membership to the Friends, which holds its open meetings in the library on the second Monday of each month at 7:00pm. Ellen Winkler, a longtime Friend and new Trustee, beamed as she looked around the room. “We’re going to try to reimagine the building from the inside out,” she said with pride.